This article is about the actor. For the football player, see Trevor Howard (footballer). Howard was born in Cliftonville, Kent, England, the son of Mabel Grey (Wallace) and Arthur John Howard. He was educated at Clifton College (to which he left in his will a substantial legacy for a drama scholarship) and at the Royal Academy of Dramatic Art (RADA), acting on the London stage for several years before World War II. His first paid work was in the play Revolt in a Reformatory (1934), before he left RADA in 1935 to take small roles. Although stories of his courageous wartime service in the British Army's Royal Corps of Signals earned him much respect among fellow actors and fans alike, files held in the Public Record Office reveal that he had actually been discharged from the British Army in 1943 for mental instability and having a "psychopathic personality". The story, which surfaced in Terence Pettigrew's biography of the actor, published by Peter Owen in 2001, was initially denied by Howard's widow, actress Helen Cherry. Later, confronted with official records, she told the Daily Telegraph (24 June 2001) that his mother had claimed he was a holder of the Military Cross. She added that Howard had an honourable military record and "had nothing to be ashamed of". After a theatrical role in The Recruiting Officer (1943) Howard began working in films with The Way Ahead (1944). His role in The Way Ahead came to the attention of David Lean, who was looking for someone to play the role of Alec in Brief Encounter (1945). Lean recommended him to Noël Coward, who agreed with the suggestion, and the success of the film launched Howard's film career. However, Lean's The Passionate Friends (1949), in which Howard played a character similar to Alec, was not as successful. The Third Man (1949), in which Howard played the slightly dry, slightly crusty, but capable British military officer Major Calloway, secured his reputation. During filming in Vienna, Howard was keen to get to his favourite bar for a drink as soon as filming had wrapped for the evening. On one occasion, Howard was in too much of a hurry to change out of his uniform as a British Army Major. After a few drinks, he got into an argument and attracted the attention of a real Major, who ordered the Military Police to arrest Howard as an impostor. Howard was forced to apologise and was summoned to appear before the British commanding general, Sir Alexander Galloway. The Heart of the Matter (1953), like The Third Man, is based on a story by Graham Greene. Howard also starred in The Key (1958, based on a novel by Jan de Hartog), for which he received the Best Actor award from the British Academy of Film and Television Arts, and in Sons and Lovers (1960), for which he was nominated for an Academy Award for Best Actor. He was nominated for a BAFTA on four other occasions. and received two other Emmy nominations, one as a lead and the other as a supporting actor. He also received three Golden Globe Award nominations. By the time of Sons and Lovers, Howard had shifted to being a character actor. His later work included such films as Mutiny on the Bounty (1962), Father Goose (a rare comedic role) (1964), Morituri (1965), Von Ryan's Express (1965), The Charge of the Light Brigade (1968), Battle of Britain (1969), Ryan's Daughter (1970), The Offence (1972), Superman (1978), and Gandhi (1982). At the time of filming White Mischief (1988) on location in Kenya during 1987, Howard was seriously ill and suffering from alcoholism. The company wanted to sack him, but co-star Sarah Miles was determined that Howard's distinguished film career would not end that way. In an interview with Terence Pettigrew for his biography of Howard, Miles describes how she gave an ultimatum to the executives, threatening to quit the production if they got rid of him. The Dawning (1988) was his final film. One of his strangest films, and one he took great delight in, was Vivian Stanshall's Sir Henry at Rawlinson End (1980), in which he played the title role. His wife, Helen Cherry, starred with him in the film 11 Harrowhouse (1974). While continuing to work in films and occasionally in stage plays, Howard also found work in television, as the Victorian prime minister in The Invincible Mr Disraeli (1963), an episode of the Hallmark Hall of Fame for which he won an Emmy award for his role and The Count of Monte Cristo (1975), in which he played Abbé Faria, for which he was Emmy nominated. Throughout his film career Howard insisted that all his contracts include a clause excusing him from work whenever a cricket Test Match was being played. Howard left behind just two Shakespeare performances, the first, recorded in the 1960s, was as Petruchio opposite Margaret Leighton's Kate in Caedmon Records' complete recording of The Taming of the Shrew; the second was in the title role of King Lear for the BBC World Service in 1986. A British government document leaked to the Sunday Times in 2003 shows that Howard was among almost 300 individuals to decline official honours. He declined a CBE in 1982. He died on 7 January 1988 from hepatic failure and cirrhosis of the liver in Arkley, Barnet, aged 74, and was survived by his widow Helen Cherry. ↑ Profile, filmreference.com; accessed 22 July 2016. ↑ "Trevor Howard details". The Guardian. 3 March 2008. 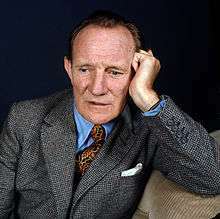 ↑ "The Passionate Lives of Trevor Howard". Ottawa Citizen. 17 February 1961. ↑ "No Sir! Stars who refused honors". CNN. 21 December 2003. Retrieved 21 September 2009. ↑ 'Bing's Lucky Number: Pa Crosby Dons 4th B.O. Crown', The Washington Post (1923-1954) [Washington, D.C] 03 Jan 1948: 12. ↑ "Hope tops list for popularity.". The Mail. Adelaide: National Library of Australia. 30 December 1950. p. 5 Supplement: Sunday Magazine. Retrieved 19 April 2014. ↑ "Vivien Leigh Actress of the Year.". Townsville Daily Bulletin. Qld. : National Library of Australia. 29 December 1951. p. 1. Retrieved 27 April 2012. ↑ "COMEDIAN TOPS FILM POLL.". The Sunday Herald. Sydney: National Library of Australia. 28 December 1952. p. 4. Retrieved 27 April 2012.